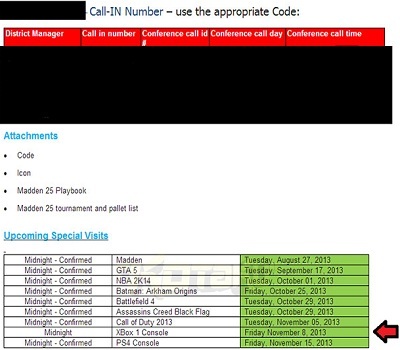 A leaked email points to Microsoft releasing the Xbox One a week before the PS4. A big part of Sony's PlayStaton 4 messaging has basically been to trump the Xbox One. Microsoft, in turn, has arguably been playing a game of catch-up that's left the console arguably on the defensive. Now, however, evidence suggests that Microsoft may be trying to take back the initiative by getting the Xbox One to gamer's first. An anonymous source from a marketing company has apparently leaked an email listing upcoming midnight Wal-Mart events. Among the listed items receiving a special opening is the Xbox One, which will apparently release on November 8th. This would put it on store shelves a full week ahead of the PlayStation 4, which Sony revealed to be launching on November 15th at Gamescom. Whether or not having to wait seven days less will be enough to tilt more consumers toward the Xbox One however, is something we'll have to wait and see. Sony arguably earned a lot of goodwill with the gamer friendly stance it took in marketing the PS4. Likewise, the PS4 being $100 cheaper than the $499 Xbox One could be enough for some gamers to hold off a week. All of this said, it's important to remember that this is all still unofficial. Even so, with the days ticking away and the Xbox One already confirmed to be launching sometime in November, there aren't really too many options for Microsoft to choose from. It can either go before the PS4 or after, and our gut says launching first is probably the better of the two.